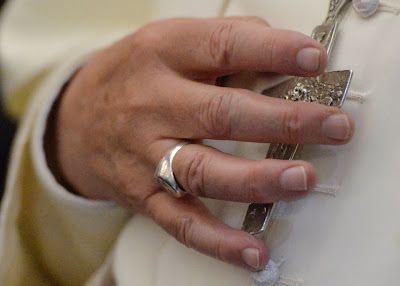 Whispers in the Loggia: "Our Authority Is Exercised In Our Ability To Serve" – To the Bishops, Francis' "Enola Gay"
"Our Authority Is Exercised In Our Ability To Serve" – To the Bishops, Francis' "Enola Gay"
Shortly before the Volo Papale left Rio last night, word quietly circulated that the Pope would hold an in-flight presser. On hearing it, it didn't take a rocket-scientist for the first thought to be, "Here comes 'gay lobby'...."
Even if it's needless to say for the more savvy of this crowd, much as any inference of a Pope's talking the "culture wars" of the secular West is sure to get tongues wagging in the wider (well, mostly English-speaking) space, it apparently bears reminding for some that Francis is infinitely more focused on and invested in the cultural war he's taken to marshaling within the church's own walls – another uphill struggle by any standard, yet a fight which he finds considerably more necessary and worthwhile, even beyond his better odds of success. Along those lines – and drawing yet again from his "baby" born at Aparecida in 2007 – the Argentine pontiff met yesterday with the executive of the CELAM, the regional mega-conference of the bishops of Latin America and the Caribbean, to lay down his emphases and priorities for the church's life on his home continent... and – because he's The Pope – now, indeed, beyond. Along with his visits to Brazil's patronal shrine and a hospital for drug addicts last Wednesday and Thursday's moving journey to a Rio slum, the post-Mass encounter at Francis' roadhouse was the last of the events Papa Bergoglio added to his first overseas trip at his own expressed insistence. Together with Saturday's "keystone" address to the Brazilian bench – and both the weekend's messages rooted in the Aparecida Document itself – the following text rounds out the most substantive programmatic guide yet to this brave new pontificate. ...and with all that in mind, have at it. I thank the Lord for this opportunity to speak with you, my brother bishops, the leadership of CELAM for the four-year period from 2011 to 2015. For 57 years CELAM has served the 22 Episcopal Conferences of Latin America and the Caribbean, working in a spirit of solidarity and subsidiarity to promote, encourage and improve collegiality among the bishops and communion between the region’s Churches and their pastors. Like yourselves, I too witnessed the powerful working of the Spirit in the Fifth General Conference of the Latin American and Caribbean Episcopate in Aparecida, in May 2007, which continues to inspire the efforts of CELAM for the desired renewal of the Particular Churches. In many of them, this renewal is clearly taking place. I would like to focus this conversation on the legacy of that fraternal encounter, which all of us have chosen to call a Continental Mission. There are four hallmarks of the Fifth Conference. They are like four pillars for the implementation of Aparecida, and they are what make it distinctive. Medellín, Puebla and Santo Domingo began their work with a process of preparation which culminated in a sort of Instrumentum Laboris which then served as a basis for discussion, reflection and the approval of the final document. Aparecida, on the other hand, encouraged the participation of the Particular Churches as a process of preparation culminating in a document of synthesis. This document, while serving as a point of reference throughout the Fifth General Conference, was not taken as a starting point. The initial work consisted in pooling the concerns expressed by the bishops as they considered the new period of history we are living and the need to recover the life of discipleship and mission with which Christ founded the Church. It is important to remember the prayerful setting created by the daily sharing of the Eucharist and other liturgical moments, in which we were always accompanied by the People of God. On the other hand, since the deliberations took place in the undercroft of the Shrine, the music which accompanied them were the songs and the prayers of the faithful. This context of prayer and the life of faith gave rise to a desire for a new Pentecost for the Church and the commitment to undertake a Continental Mission. Aparecida did not end with a document; it continues in the Continental Mission. 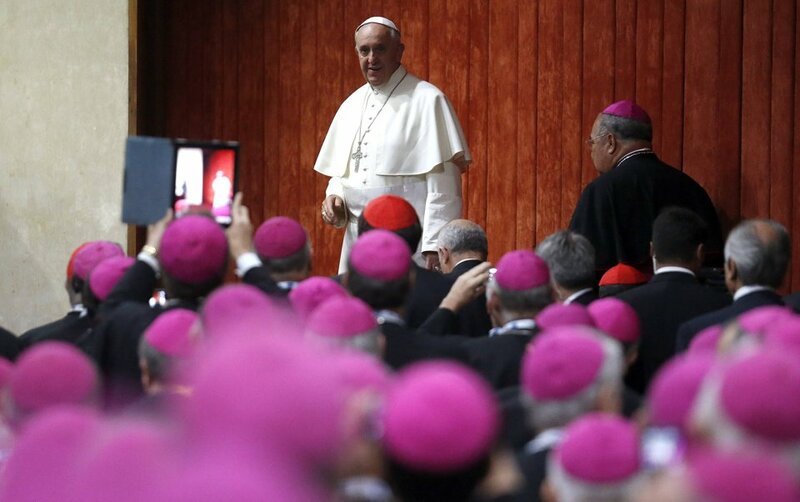 It was the first conference of the bishops of Latin America and the Caribbean to be held in a Marian shrine. The Continental Mission is planned along two lines: the programmatic and the paradigmatic. The programmatic mission, as its name indicates, consists in a series of missionary activities. The paradigmatic mission, on the other hand, involves setting in a missionary key all the day-to-day activities of the Particular Churches. Clearly this entails a whole process of reforming ecclesial structures. The “change of structures” (from obsolete ones to new ones) will not be the result of reviewing an organizational flow chart, which would lead to a static reorganization; rather it will result from the very dynamics of mission. What makes obsolete structures pass away, what leads to a change of heart in Christians, is precisely missionary spirit. Hence the importance of the paradigmatic mission. The Continental Mission, both programmatic and paradigmatic, calls for creating a sense of a Church which is organized to serve all the baptized, and men and women of goodwill. Christ’s followers are not individuals caught up in a privatized spirituality, but persons in community, devoting themselves to others. The Continental Mission thus implies membership in the Church. An approach like this, which begins with missionary discipleship and involves understanding Christian identity as membership in the Church, demands that we clearly articulate the real challenges facing missionary discipleship. Here I will mention only two: the Church’s inner renewal and dialogue with the world around us. Aparecida considered Pastoral Conversion to be a necessity. This conversion involves believing in the Good News, believing in Jesus Christ as the bearer of God’s Kingdom as it breaks into the world and in his victorious presence over evil, believing in the help and guidance of the Holy Spirit, believing in the Church, the Body of Christ and the prolonging of the dynamism of the incarnation. Consequently, we, as pastors, need to ask questions about the actual state of the Churches which we lead. These questions can serve as a guide in examining where the dioceses stand in taking up the spirit of Aparecida; they are questions which we need to keep asking as an examination of conscience. 1. Do we see to it that our work, and that of our priests, is more pastoral than administrative? Who primarily benefits from our efforts, the Church as an organization or the People of God as a whole? 2. Do we fight the temptation simply to react to complex problems as they arise? Are we creating a proactive mindset? Do we promote opportunities and possibilities to manifest God's mercy? Are we conscious of our responsibility for refocusing pastoral approaches and the functioning of Church structures for the benefit of the faithful and society? 3. In practice, do we make the lay faithful sharers in the Mission? Do we offer them the word of God and the sacraments with a clear awareness and conviction that the Holy Spirit makes himself manifest in them? 4. Is pastoral discernment a habitual criterion, through the use of Diocesan Councils? Do such Councils and Parish Councils, whether pastoral or financial, provide real opportunities for lay people to participate in pastoral consultation, organization and planning? The good functioning of these Councils is critical. I believe that on this score, we are far behind. 5. As pastors, bishops and priests, are we conscious and convinced of the mission of the lay faithful and do we give them the freedom to continue discerning, in a way befitting their growth as disciples, the mission which the Lord has entrusted to them? Do we support them and accompany them, overcoming the temptation to manipulate them or infantilize them? Are we constantly open to letting ourselves be challenged in our efforts to advance the good of the Church and her mission in the world? 6. Do pastoral agents and the faithful in general feel part of the Church, do they identify with her and bring her closer to the baptized who are distant and alienated? As can be appreciated, what is at stake here are attitudes. Pastoral Conversion is chiefly concerned with attitudes and reforming our lives. A change of attitudes is necessarily something ongoing: “it is a process”, and it can only be kept on track with the help of guidance and discernment. It is important always to keep in mind that the compass preventing us from going astray is that of Catholic identity, understood as membership in the Church. We do well to recall the words of the Second Vatican Council: “The joys and hopes, the grief and anguish of the people of our time, especially of those who are poor or afflicted, are the joys and hopes, the grief and anguish of the followers of Christ as well” (Gaudium et Spes, 1). Here we find the basis for our dialogue with the contemporary world. Responding to the existential issues of people today, especially the young, listening to the language they speak, can lead to a fruitful change, which must take place with the help of the Gospel, the magisterium, and the Church’s social doctrine. The scenarios and the areopagi involved are quite varied. For example, a single city can contain various collective imaginations which create “different cities”. If we remain within the parameters of our “traditional culture”, which was essentially rural, we will end up nullifying the power of the Holy Spirit. God is everywhere: we have to know how to find him in order to be able to proclaim him in the language of each and every culture; every reality, every language, has its own rhythm. 1. The missionary discipleship which Aparecida proposed to the Churches of Latin America and the Caribbean is the journey which God desires for the present “today”. Every utopian (future-oriented) or restorationist (past-oriented) impulse is spiritually unhealthy. God is real and he shows himself in the “today”. With regard to the past, his presence is given to us as “memory” of his saving work, both in his people and in each of us as individuals; with regard to the future, he gives himself to us as “promise” and hope. In the past God was present and left his mark: memory helps us to encounter him; in the future is promise alone… he is not in the thousand and one “futuribles”. The “today” is closest to eternity; even more: the “today” is a flash of eternity. In the “today”, eternal life is in play. Missionary discipleship is a vocation: a call and an invitation. It is given in the “today”, but also “in tension”. There is no such thing as static missionary discipleship. A missionary disciple cannot be his own master, his immanence is in tension towards the transcendence of discipleship and towards the transcendence of mission. It does not allow for self-absorption: either it points to Jesus Christ or it points to the people to whom he must be proclaimed. The missionary disciple is a self-transcending subject, a subject projected towards encounter: an encounter with the Master (who anoints us as his disciples) and an encounter with men and women who await the message. 2. The Church is an institution, but when she makes herself a “centre”, she becomes merely functional, and slowly but surely turns into a kind of NGO. The Church then claims to have a light of her own, and she stops being that “mysterium lunae” of which the Church Fathers spoke. She becomes increasingly self-referential and loses her need to be missionary. From an “institution” she becomes a “enterprise”. She stops being a bride and ends up being an administrator; from being a servant, she becomes an “inspector”. Aparecida wanted a Church which is bride, mother and servant, a facilitator of faith and not an inspector of faith. 3. In Aparecida, two pastoral categories stand out; they arise from the uniqueness of the Gospel, and we can employ them as guidelines for assessing how we are living missionary discipleship in the Church: nearness and encounter. Neither of these two categories is new; rather, they are the way God has revealed himself to us in history. He is the “God who is near” to his people, a nearness which culminates in the incarnation. He is the God who goes forth to meet his people. In Latin America and the Caribbean there are pastoral plans which are “distant”, disciplinary pastoral plans which give priority to principles, forms of conduct, organizational procedures… and clearly lack nearness, tenderness, a warm touch. They do not take into account the “revolution of tenderness” brought by the incarnation of the Word. There are pastoral plans designed with such a dose of distance that they are incapable of sparking an encounter: an encounter with Jesus Christ, an encounter with our brothers and sisters. Such pastoral plans can at best provide a dimension of proselytism, but they can never inspire people to feel part of or belong to the Church. Nearness creates communion and belonging; it makes room for encounter. Nearness takes the form of dialogue and creates a culture of encounter. One touchstone for measuring whether a pastoral plan embodies nearness and a capacity for encounter is the homily. What are our homilies like? Do we imitate the example of our Lord, who spoke “as one with authority”, or are they simply moralizing, detached, abstract? 4. Those who direct pastoral work, the Continental Mission (both programmatic and paradigmatic) are the bishops. Bishops must lead, which is not the same thing as being authoritarian. As well as pointing to the great figures of the Latin American episcopate, which we all know, I would like to add a few things about the profile of the bishop, which I already presented to the Nuncios at our meeting in Rome. Bishops must be pastors, close to people, fathers and brothers, and gentle, patient and merciful. Men who love poverty, both interior poverty, as freedom before the Lord, and exterior poverty, as simplicity and austerity of life. Men who do not think and behave like “princes”. Men who are not ambitious, who are married to one church without having their eyes on another. Men capable of watching over the flock entrusted to them and protecting everything that keeps it together: guarding their people out of concern for the dangers which could threaten them, but above all instilling hope: so that light will shine in people’s hearts. Men capable of supporting with love and patience God’s dealings with his people. The Bishop has to be among his people in three ways: in front of them, pointing the way; among them, keeping them together and preventing them from being scattered; and behind them, ensuring that no one is left behind, but also, and primarily, so that the flock itself can sniff out new paths. I do not wish to go into further detail about the person of the Bishop, but simply to add, including myself in this statement, that we are lagging somewhat as far as Pastoral Conversion is concerned. We need to help one another a bit more in taking the steps that the Lord asks of us in the “today” of Latin America and the Caribbean. And this is a good place to start. I thank you for your patience in listening to me. Pardon me if my remarks have been somewhat disjointed and please, I beg that we take seriously our calling as servants of the holy and faithful people of God, for this is where authority is exercised and demonstrated: in the ability to serve. Many thanks.